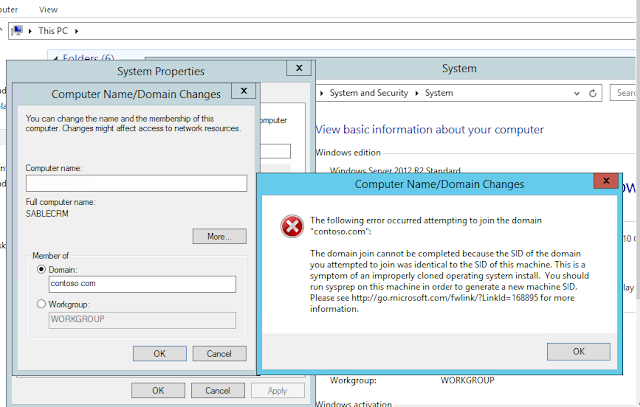 I got this error while adding/joining my windows server 2012 R2 to my a domain. it was due to wrong/improper configuration of server (this Vm server was cloned and was SID was not configured properly. ntdsutil, and then press ENTER. To access Help at any time, type ? at the command prompt, and then press ENTER. DNSNameOfServer, and then press ENTER. Connect to the server that stores your SAM database. check duplicate sid, and then press ENTER. A display of duplicates appears. cleanup duplicate sid, and then press ENTER. Ntdsutil confirms the removal of the duplicate. q, and then press ENTER. No Comment to " Error : This is a symptom of an improperly cloned operating system install. you should run sysprep on the machine in order to generate a new machine SID. Duplicate SID Error in windows server 2012 "